Folks from all walks of life rallied around Katie Goldman after word got out she was being bullied at school for liking Star Wars. This hat, fashioned after Princess Leia’s hairdo from A New Hope, is just one of many donations she’s received over the last few days. When 7-year old Katie Goldman asked for a pink water bottle to take to school, her mother knew something was wrong. After all, the Evanston, Ill. first-grader loved her Star Wars backpack and thermos. Did something happen to them? It turns out Katie had been told that Star Wars is “only for boys” by other kids at school. She had been bullied for being different. That was the final straw. Katie was different enough already. Oregon coach Chip Kelly and D.J. 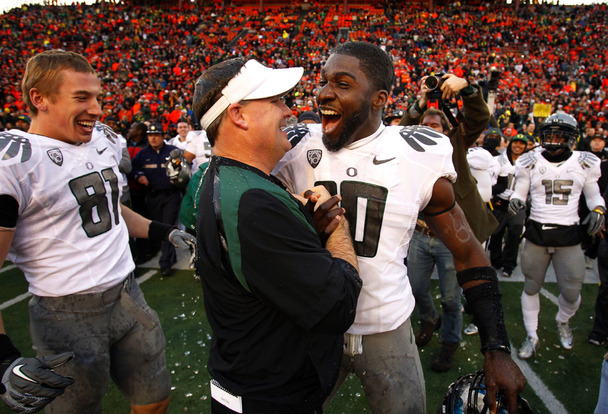 Davis celebrate the Ducks’ victory over rival Oregon State on Saturday. The win at Reser clinched Oregon’s spot in the BCS title game in Glendale, Ariz.
Don’t let the headline fool you: We’re not delving into newspaper archives and analyzing coverage of a 160-year old war. Although that would be a fun project. Let’s put it on the list, shall we? 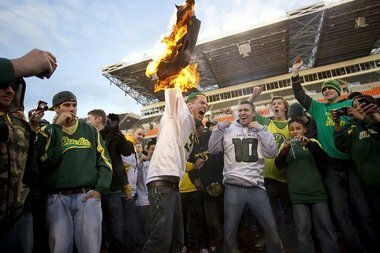 No, we’re talking about The Register-Guard‘s coverage of the Oregon football team’s win over rival Oregon State for a shot at the Bowl Championship Series title. Sports and football haters might scoff at the amount of attention that the Ducks have garnered over the last month. Heck, I would have been right there with you about five years ago. But this is history. It’s kind of a big deal. Even if the folks at the Guard didn’t care for football, much of its readership does. In the end, that’s what really matters in the journalism game: What do your readers want? And it’s not just about the coverage. It’s not merely the words you write, the stories you tell or the photos you choose to accompany both. It’s about the whole package. The individual pieces need to work seamlessly together in order to create an appealing product. But how do you present it? How should it flow? Where does each story belong? 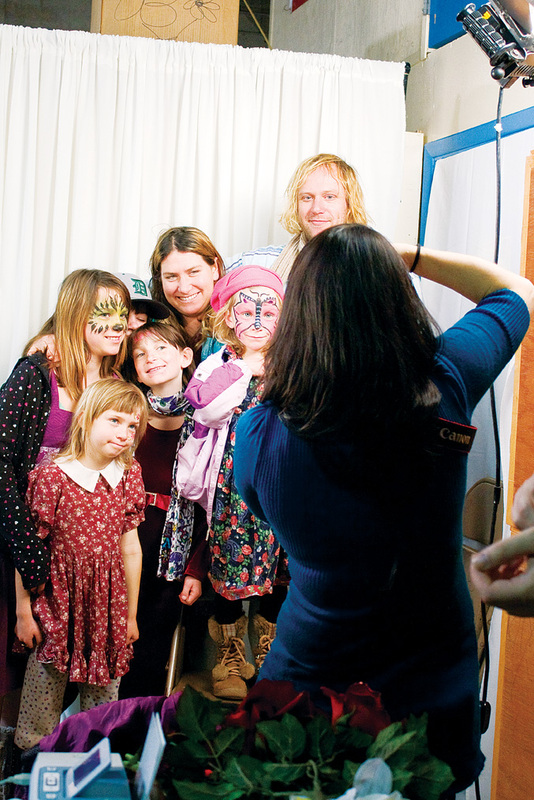 Aloma Calacin takes a portrait for the Sanchez family during the Whiteaker Community Dinner on Thanksgiving. The event celebrated its 22nd anniversary this year. As Gabe Sanchez and his family lined up for a family portrait, Aloma Calacin sidestepped several other photographers, a woman dragging a plastic bag full of used clothing and a man holding a platter full of desserts. It might be an unusual sight anywhere else on another day of the year, but on Thanksgiving at Whiteaker School, nobody thinks twice about it.